Now that we've all seen video of Baltimore Ravens running back Ray Rice knocking out his then-fiancée Janay Palmer, a set of related and legitimate questions comes up. Who all saw this video before today? When did they see it? Did the NFL use it to determine Rice's two-game suspension? There is one other thing I did not write or refer to, and that is the other videotape the NFL and some Ravens officials have seen, from the security camera inside the elevator at the time of the physical altercation between Rice and his fiancée. And here's ESPN's Chris Mortensen, also from July. We saw the TMZ video of what happened outside—when he was dragging her out unconscious—but inside, I'm told from those who have seen the video, it wasn't pretty. In fact, she attacks him—we don't know the reason why—and he strikes her, strikes her hard. And her head—according to the sources I've spoken to—struck the rail inside the elevator and she was unconscious. Which is exactly what today's video shows. Only thing we know for sure is that police who arrested Ray and Janay and then let them leave together that night saw the video. But outwardly, and possibly for reasons having to do with both the legal elements of the case and with public relations, the NFL itself was opaque on whether it had seen the video. Privately, top reporters were told in no uncertain terms that the video existed, that the NFL had seen it, that it showed Janay Palmer acting violently toward Rice, and that, if released, it would go some way toward mitigating the anger against him. One of the league's most devoted mouthpieces described the video for us on an off-the-record basis, going off what his sources had told him. The implication was clear: If you saw this video, you'd know why Rice only got two games. 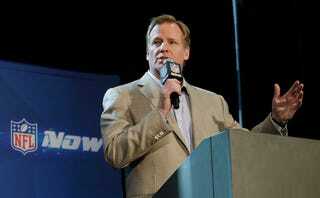 Now that the video's out, the NFL and the Ravens are reversing course. There are three possible explanations here. The first is that every single reporter who said the NFL had seen the video was lying. This seems unlikely, since they were all telling the same lie, both for public consumption and in their off-the-record talks with us. The second is that the NFL was lying to all of the top football reporters back then about having seen the video, in some attempt to smear Janay Palmer. The third is that the NFL is lying now about not having seen the video—that league officials saw what everyone has now seen, for whatever reason actually found it exculpatory, and are now making false claims to protect the league's image. This interpretation is supported by an employee of the Revel, the Atlantic City casino where the fight took place. He tells TMZ that the NFL saw the footage before disciplining Rice. Whatever the case, it's almost certain that the NFL lied at some stage here, and that the league played a handful of its most loyal reporters in the process, suborning them into a smear campaign against a victim of domestic violence. Those reporters, who regularly and uncritically pass along the league's party line but are rarely exposed like this, are the ones who look foolish now. Maybe it's time for them to cut these particular puppet strings and name the sources who burned them so badly, which would do something to show that they're reporters, and not stooges. If you'd like to outsource the job to us, feel free to email us.